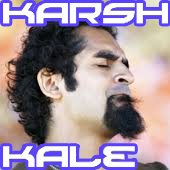 Karsh Kale was introduced to me many years ago by some of my High School friends. Been a fan ever since. Karsh Kale (pronounced Kursh Kah-lay) is an Indian American musician, producer and composer, and is considered one of the pioneering figures in defining the Asian Underground genre by mixing disparate genres of music such as Indian classical and folk with electronica, rock, pop and ambient music. In addition to production, remixing, and DJ work, Kale is known for his tabla drumming and film composition.